Grains are mixed in the overnight session. Corn up a penny, wheat down 2 cents, beans up 1 ¼ cents. For the week HRWW is up 3 cents, corn is down 4 cents and soybeans are down a penny. Argentina corn planting is estimated at 93% complete, which is very close to average with the crop rated much better than last year’s 54% P/VP. Prices for Russia’s wheat keep inching higher as their on-farm stocks are estimated 40% smaller than a year ago. Signs their supplies are being drawn down and tightening. There is talk that next week’s US and China trade talks may be extended. There is also talk that US and China may be working on a grain deal that might include annual imports of $30 billion dollars of US Ag products including soybeans, corn, wheat, ethanol and pork. U.S. total fuel ethanol production fell by 20,000 barrels per day this week to 1.031 million bpd; that was down 31k bpd from the comparable week last year, and also 20k bpd behind the same week two years ago. 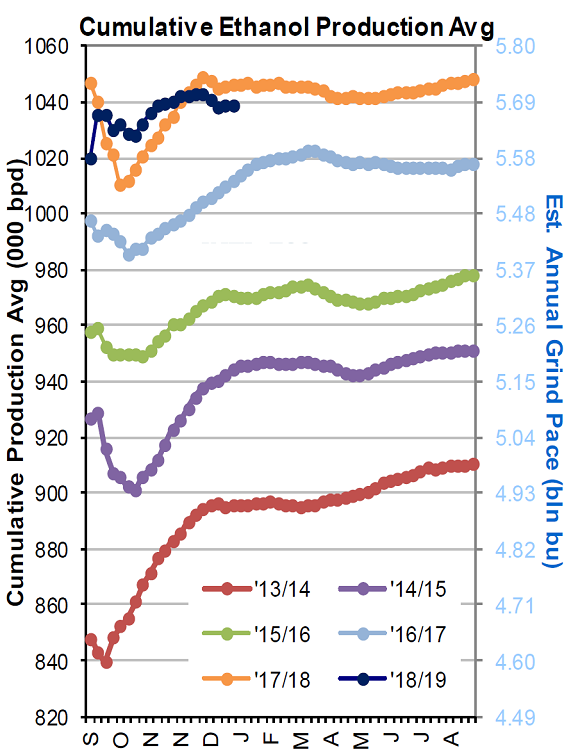 Cumulative ethanol output since September 1 was steady for the second straight week at 1.039 mln bpd, which stands 8k bpd behind last year’s pace through 20 weeks of the 2018/19 corn marketing year; that indicates a YoY corn use for ethanol decline around 40 mln bushels more than the USDA is estimating.